Need ideas for Christmas gifts for 40 nurses. This needs to be inexpensive. I'd make either bags of Chex Mix or Hidden Valley Ranch oyster crackers-also wonderful if you have any diabetics in the group! My children's teachers loved getting Chex Mix from them each Christmas! Even little jars or cups (try Good Will for unusual ones!) filled with hard candy or fudge would be fun! Tie them with a fancy ribbon and bow and you're good to go! I remember several years ago that my husband received for Christmas, a little clear plastic bag that had some oatmeal and a bit of glitter in it, and it was labeled "Reindeer Food." The bag had a tiny piece of curling ribbon on it. We loved it. We are 30 in our Sunday School class and every year it gets more expensive. I have done clear glass ball ornaments with paint poured inside and swished and then written on the outside the year and class name. 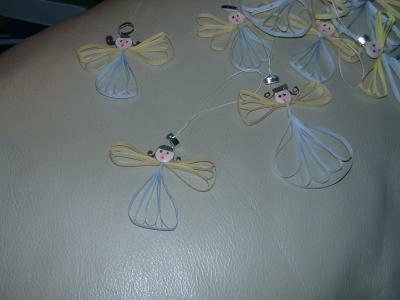 This year I am quilling angel (just paper and time) hanging ornaments. I have made homemade soap, candles, etc. Fast, cheap and useful! Hi! One of my favorite gifts--for someone I have not already gifted with this--is to make a rice bag. You can take either a nice hand towel, or some inexpensive polar fleece (I usually use the fleece) and sew a square packet, then fill it with rice, and sew it shut. With the fleece, I then take a pair of scissors and fringe the edges for a nice look. The recipient can throw it in the microwave for roughly two minutes and it is a portable heating pack. The cost of something like this is very low, but for a sore spot or cold feet, it's indispensable, and takes very little time to make, even for a beginning sewer. Good luck! If you can afford it, get each one a cup from a thrift shop or dollar tree, and also put in a tea bag, hot broth bag, apple cider mix, a few jelly beans or red hots, and of course, their cocoa! Get some colored red and green cellophane that is out now, and tie it with a scrunchy or two if they have long hair, and if not, ribbon or lace. The whole thing might cost 1.50 each. If you can't afford the mugs, bundle everything in a clear plastic cup with stickers on it like "Nurses are nothing without their patience" or "Nurses are all Heart". Good luck and have fun! Here are some you can use that I have come across from time to time. Personalized pens, Christmas ornaments, $5 gift certificate toward a pair of nursing shoes, pants, shirts, etc. (I know, too expensive). If you're a boss then at the very least a 10 dollar gift card or gift certificate in a personalized 'individual's name on the envelope' Christmas card. If you're a co-worker even something as simple as a lollipop with a Christmas ribbon tied to the base of the pop would be a good will holiday jesture. How about jar mixes? You could make jars of Friendship Tea, or cookies/brownies in a jar. Everything is a Dollar, Dollar Tree, etc have many nice things for a dollar apiece. Also they sell craft items (many pieces in packs for $1.00), so if you crafted something it would be very inexpensive. I would say the chex mix or the Hidden Valley Ranch oyster crackers. They will keep and are easy to carry in your pocket to nibble on. You can nibble on them while doing other things and does not get your hands so dirty like chocolate would.I am a daycare teacher and I love to get these because I can eat them while doing my lesson plans or reading. This is really cheap. I am a nurse and I always give my nursing assistants a christmas card with a envelope of hot chocolate mix. I usually get it on sale. Prob averages out to 10cents each. They love it. I tried to give them something else one year and their was an uproar. They wanted there hot chocolate! Scented candles, since a nurse spends much of her day with many not so pleasant odors. Gather 1, 3 or 5 (never even numbers) candles on a small mirrored plate. Wrap in clear cellophane and put curling ribbon around top. This can be from $2 to $6 per gift depending on the number of candles. If you want to put a little box of small barn matches in to light the candles that would be a nice touch. Candles, mirrors, cellophane and ribbon can all be found at the Dollar Store. I was going to suggest a mug or possibly a pen they can use for their work. However, after reading about the hot chocolate, I like that idea better. I wouldn't buy anything at a Dollar store as I think one dollar per item is expensive. That would total $40. Hot chocolate would be $4.00, and it is something everyone can use. Lotion would be perfect. Just a small tube or bottle that fits in a pocket. You can get them at Walmart or Bath and Body for close to $1.